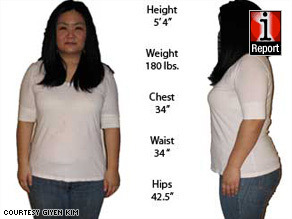 (CNN) -- This week, Giyen Kim, 34, reached a personal milestone: She has lost 10 pounds since the beginning of the year. Giyen Kim, 34, has lost 10 pounds since January 1. She said she feels like it will be easier to lose more weight. This progress feels slow, she said, in comparison with her previous weight loss attempts, which consisted of crash dieting. But she found that those diets weren't sustainable. This time, she's looking to find a lifestyle she can keep. Reaching this 10-pound milestone, from 190 to 180 pounds, makes her feel as if it will be easier to lose more weight, she said. She doesn't feel physically different, but she does notice a change from previous pictures of herself, she said. Her original goal for the year was to get closer to her pre-pregnancy weight of 120 pounds. Kim has had a hard time exercising recently because her uncle, 90, passed away, and the grieving process has been difficult. But she plans to resume working out soon and wants to take classes at her gym. She also eats one vegan meal every day. Often, the initial weight loss will seem the easiest, and then the loss slows somewhat over time, said Tara Gidus, dietician for the Orlando Magic NBA team and owner of Tara Gidus Nutrition Consulting in Orlando, Florida. Exercise is key in speeding things up when you've reached a plateau, she said. It's important to find a physical activity that you enjoy doing and to vary the exercise routine -- for example, raising the incline on a treadmill to step up the intensity, she said. Gidus usually recommends losing about 2 pounds a week, or about 5 to 8 pounds a month. At that rate, someone like Kim could lose 50 pounds in six months, she said. A pace faster than that -- such as 10 pounds per month -- would be hard to keep up, Gidus said. People with on weight-loss journeys should have encouragement from friends, family or people in support groups or online communities, she said. Her next goal is to lose 15 more pounds -- for a total of 25 -- by her birthday, March 24, and reward herself with a digital single-lens reflex camera, which professional photographers use. "That's basically 2 pounds a week, plus 3 more," she said. "It's ambitious, but I really want that camera."